Documentation and SupportReleases Lychee Release Notes 2016-12-10Snowflake Support Now Includes Import in Addition to Export. 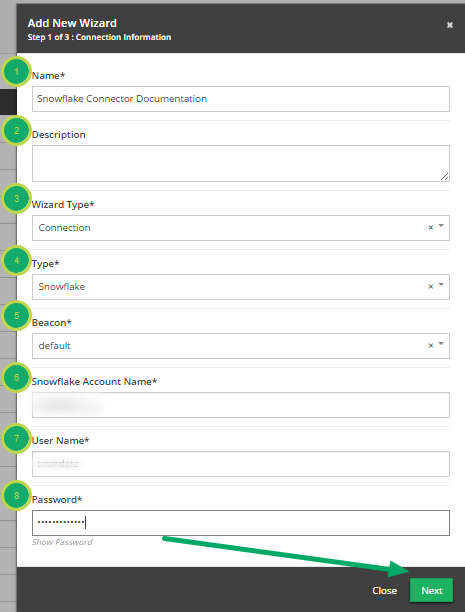 It is now possible to import data into the TMMData System from Snowflake. 1.3. 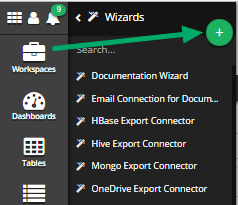 Fill out the 'Add New Wizard' modal. Name: The name of this Connector. Description: An explanation of this Connector. Beacon: The beacon to use with this Connector. Snowflake Account Name: The account name for Snowflake. User Name: The user name for the Snowflake account. Password: The password for the Snowflake account. 1.4. 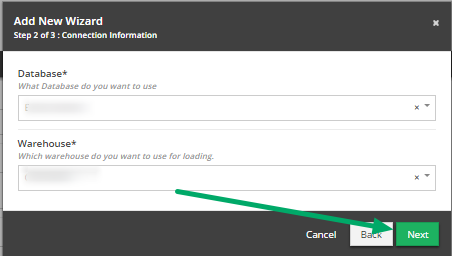 Select the Warehouse and Database to use. 1.5. Select the Schema to use. 1.6. Congratulations, you have successfully created a Snowflake Connector! 2. 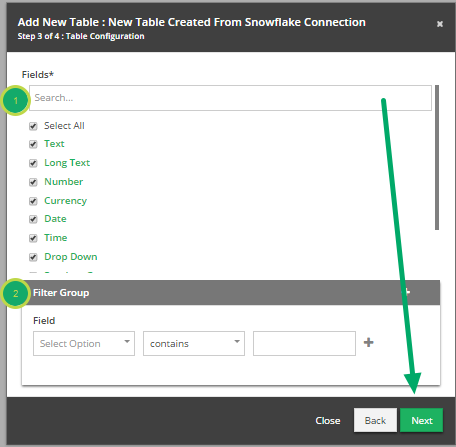 Create New Table From Snowflake Connection. Click on the 'System' icon. 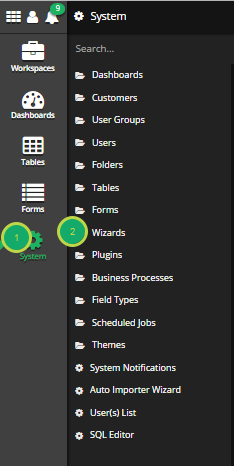 Click on the 'Tables' System Tool. This will open the 'Add New Table' modal. 2.3. 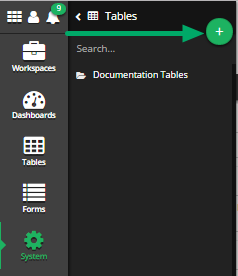 Fill out the 'Add New Table' modal. Name: The name that this table will be labeled in the TMMData System. Description: An overview of this table. Any additional information about this table can be entered here. Folder: The folder in which to place the table. Backup: Whether or not this table should be backed up. Fields: Place a check-mark in the box beside all fields you wish to add to the new table. Filter Group: Set up any filters here to limit the data entering the new table. Select Statement: The SELECT statement that has been generated to pull the data from Snowflake. Last minute adjustments can be made here. 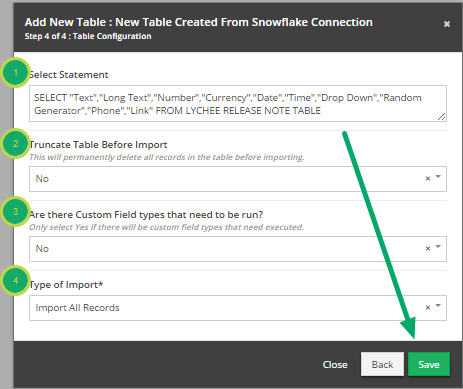 Truncate Table Before Import: Should the Table data be deleted before the import from Snowflake? Are there Custom Field types that need to be run? : Only select 'Yes' if there will be custom field types(in the new table) that need executed. 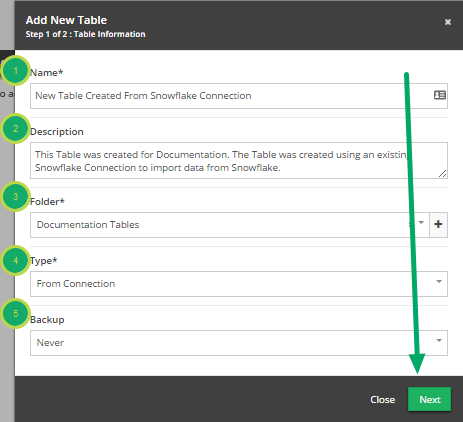 Import New Records and Update Existing (Merge): Same as above but, in addition to Importing new records, it updates any records in the Import Table wherever data was updated in Snowflake. Click 'Save' when finished to create the Table. 2.7. Congratulations! 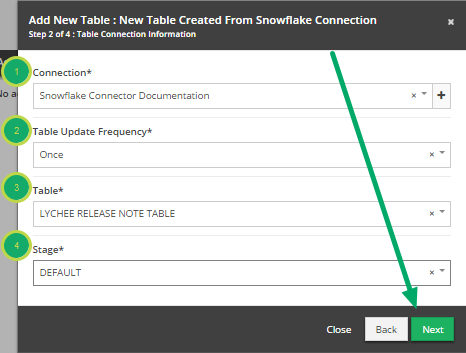 You have successfully created a Table from a Snowflake Connection. Prev: Option Added to Allow Conversion of Connector Tables into New Standard Tables. Next: Couchbase Connections Now Supported.